Resin Eagles are a prestigious award, perfect for corporate, school or sporting events. Those presented with eagle awards are instilled with a sense of high honor. A Sculpted Glass Award Depicting a Perched Eagle on matching Glass Base; Includes Velour Lined Presentation Box. Finely detailed eagle figure, cast metal with antique bronze finish. American walnut base. Solid brass engraving plate. Individually boxed. Finely detailed eagle figure, cast metal with antique bronze finish on a Black Wood Base. Black piano-finish base. Solid brass engraving plate. Individually boxed. 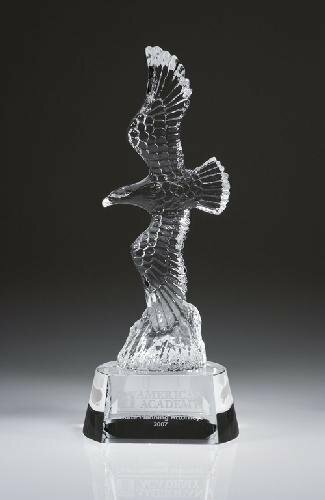 Honor your recipient with the soaring Crystal Grand Eagle Award. The crystal eagle is made by intricate molding process for its details and expression.